Taking the Long Way Home: Are You Brave Enough? And for me it really is all about that last part – – how we view ourselves. I have done a couple of things others deemed brave. But I didn't leave it about myself. Yet. I'm still working on that too--how I see myself. I've never considered myself to be brave. But when I was writing this--well, I guess I am! I'm definitely brave, but I run for different reasons that most coaches or people at my "level": I run to run. The races give me an excuse. Yes, you are brave! At least, that's how I see you! Great post my friend! It's amazing really what incredible adventures life can take us on once we dare exit that comfort zone. So true! And it helps to have friends who push me out of that comfort zone! I agree! But you have to be brave enough to make those goals--and then yes, seeing them through! i would say somedays i am brave and others not so much. i do like to think i will try anything once! I can't say that about myself--I'll never go skydiving or scuba diving! I love the transparency of this post. Being brave is something I struggle with daily. I love your tenacity and that you realize you are so brave. Running helps me too--I signed up for the half-marathon that almost defeated me last year. I'm determined to PR! I love that you are going to tackle the beast again! That's brave! Its always daunting to push yourself outside of your comfort zone, but doing so can only help make you stronger. I have never considered myself brave but perhaps some of the things I've done lately would suggest otherwise. Great post Wendy! I think even blogging takes courage! I'm not sure that I'm very brave with my running, but I do think that running gives me confidence to be brave in other areas. I think you're brave with your running! You didn't let the weather intimidate you on Sunday, and you crushed that race. The idea of open water swimming scares me! I don't know that I want to brave and learn how to swim like that. 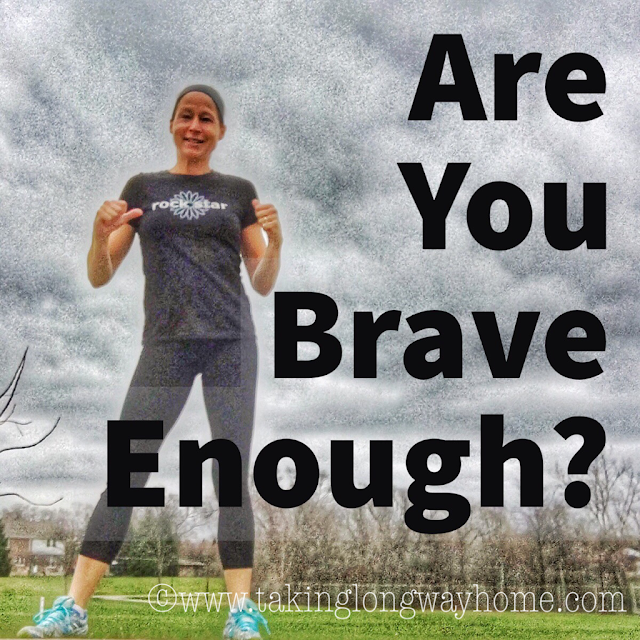 Running helps push me out of my comfort zone...I am still working on leaving that comfort zone....great post Wendy! I go in and out of my comfort zone! It's nice to have it. Seriously, I don't consider myself to be brave. Have I "braved" some things? Yes. But I can definitely let fear of the unknown stop me in my tracks, too. I look at my mom, though, and how much she has changed throughout her life, and as always, looking at her, although I love her, I can see what I don't want out of life. One of my husband's hobbies in pistol shooting. He complains all the time that he almost never gets to go to his matches. And that's because he chickens out at the least little sign of bad weather. His first match was this past Saturday. It rained the day before, but not too bad. Did he go? Of course not. I tried to jolly him into doing it, but he wouldn't budge. It snowed/sleeted the night before my race. The roads were an icy mess. I went anyway (and thankfully the roads where the race were run were perfectly clear). And my PT appt Monday? Ugh, almost blizzard conditions & they basically almost didn't clear the roads until the evening. It took me 45 minutes to get home (should only take 15). So yes, running does push me out of my comfort zone -- in a good way! Imagine how boring our lives would be if we didn't run! Being a regular reader of your blog, I do think of you as very brave and inspiring. Running and the running community has made me more brave than I used to be. I'd like to push myself out of my comfort zone a little more. I always get scared when I get past my comfort zone--but I've never regretted pushing out of it! I know I'm not brave but I'm working on trying to do small things that take me out of my comfort zone. Oh, if you're working on it, that makes you brave! It would be so easy to just sit back and stay in the same mode. Sometimes I think I am brave but I know I do hold myself back with other things. Baby steps. For sure, we are all like that! I'll never do certain things. Like skydiving. Or binge drinking. Not a fan of the hangover. I love this! It's such a shift in mentality for so many of us, but we really must move beyond our comfort zones if we want things to change. I had to be brave when I first took up running in 2010, running my first mile at almost 250 pounds. It was so worth it and I try to remind myself of that whenever I'm asked to be brave or do something scary. And look how far you've come! Awesome! Sometimes I just gotta do it. I sign up for, plan, etc, and when it comes around I just go for and do my best. I think many things it's just a step of faith. Yep, it's just a leap of faith! Or as I like to think, it's like jumping off the high dive in the pool. Yes! I have done so many races I was terrified to do. But I stuck through all the anxiety and it's been worth it! Brave? Not really. But I like a challenge so that's where running comes in. You are amazing - weight lifting, yoga, biking...superwoman. Haha! I don't know about superwoman. I just like a little variety in my workouts! Amen sister- be brave and get outside your comfort zone! When I became a ZOOMA ambassador last year I got a free race entry for any distance and I asked myself, why not the half? I made my mind up then to do it! Funny how one decision leads to another and another! I definitely have the mindset of "why not me?!" and it's served me well is no many areas of my life. Sure it can be scary, but most things that are worth it are scary. Fabulous post! You sure sound brave :) I'm brave enough to go beyond my comfort zone and try new things, taking friends do with me if they want but going it alone when I need to. I'm also brave enough to do things alone, without the net of others around me. I like to think that I'm brave but bottom line, it takes courage to leave the zone! Yes! That's what I tell people when they ask me why? Because...life... you get only one trip around, may as well have no regrets! I adore this post. You ARE brave! I get it moods sometimes where I just feel like I'll never be good enough - but then I try to pull myself out and remember, like you said, that I can do hard things! More than most. You are awesome. You are brave. You are a rockstar. I get those moods too, where I get so down on myself. But I just pull myself back up again and push myself along. It's not easy but it's always worth it. I absolutely loved this post! You said the things I think all the time. What would I be today if I hadn't been brave enough to step into my first crossfit class by myself at the age of 47? Today, at almost 51, I'm training for a long-course duathlon and hopefully will complete my first sprint triathlon this summer. My body doesn't always cooperate the way I want it to, but the thought of slowing down and "taking it easy" terrifies me! I'm so excited that you are doing new things! I'm scared to slow down too. Altho this marathon training cycle has been a little more challenging than I like! Brave is really good! And that you are! I told Allie (Vita) that I used to get scared of signing up for races, because having to tell my family about it, but now I have taken to the Wendy Rivard way to sign up for races "Sign up first, explain later!". So now we can say there is a Wendy way to be Brave!! Haha! Glad I could be inspiration for you (good and bad!)! I struggle with being brave. One of my goals this year was to not let fear hold me back, so I'm working on it but it's definitely a process. It's an ongoing goal for me. I can relate to this so much! I hated running when I was younger and the thought of running more than a mile or two was terrifying! But after running for exercise in college, I started to love it and slowly began increasing my pace and distances. I never thought I could run even a half marathon by now I'm signed up to run my first full marathon! Running has definitely made me brave. I'm so excited for you to run your first. The only thing I can tell you about that is to enjoy the ride. There is nothing like the feeling of crossing that finish line. I still don't have a tattoo! "I love that I'm crushing expectations. I'm getting stronger and I'm getting faster." This is a great post. I think athletically I'm good with being brave - not being afraid to tackle new races or challenges. But I actually struggle with being brave more in the work & career arena! I feel like the bravery I've attained from running has transferred over to my work and home life! Brave....it is so hard for me to think about how I have been brave but I like your thought on pushing past your comfort zone. I have done that in a few aspects of my life over the past few years. It is scary at first but once you do it or get into it always glad to have taken the chance to be Brave! I read your blog and I think brave! Playing football? That's brave! Love, love, love that magnet. You are amazing. You have definitely conquered and overcome the demons and injuries and all manner of things. You have definitely earned the title of brave. Brave or foolish? Ha! We'll see in a couple of weeks. Thanks for all your support. You're pretty brave yourself! I'm working on being brave. Baby steps. Good on you for going clipless! I'm not quite there yet when I'm outdoors. I absolutely love this message! I think courage (and not skill, money, whatever else) is the biggest things that separates the doers from the thinkers. That's the best comment so far! So true. What an inspiring post! I think in order to succeed in anything in life, you have to be brave and step out of your comfort zone. I love that you haven't slowed down and don't see it happening any time soon! There's still so much that I want to do! Wow Wendy....I'm reading this late Wednesday night after a long day, and it's just perfect...I need that magnet....I find that if I'm not brave enough to try something, then it means that I don't really really want it. That's a really good point. For example, I don't want to skydive. So clearly, I don't need it! In all seriousness, I don't ever want my fears to keep me from chasing my dreams. Most day's I am brave but then there are some days not so much. When life feels like it's too much I search for that comfort zone I stepped out of. And that's the thing about the comfort zone..it will always be there for you! Love this post! Yes, running has changed my life as well. I am so thankful for this sport and the community it brings. You are an inspiration Wendy! Don't ever stop being BRAVE! I agree, you need to step outside your comfort zone. Dreams don't happen by waiting around for them to come to you. I don't think I'll ever stop being brave. Because that would mean I'm getting old, and we both know that ain't happening! Fantastic inspiring post! Im applying for Chicagao this fall.....in hopes of another BQ. I qualified last year, but was one second shy relative to those faster. ONE. Doh!. Did you hear my heart break as i typed that. sigh. I got some serious unfinished business. sigh. But in my case it's not bravery I need, but patience. Patience with my body that it does what i need it to do. Come on old knees.....stay with my brave heart. I'd still love to BQ--that is still a dream for me! I hope you do it! I'll be at Chicago this year as a spectator. I need to let my old feet to rejoin my brave heart!!!! I always consider myself brave. Slightly stupid, but brave whenever I go off on my own to explore new trails. I really should have a plan but curiosity gets the better of me! I like that slightly stupid but brave. That describes me to a t! I think you are an incredibly inspirational woman, Wendy! You may feel anxiety and a lack of self confidence, but your actions and your accomplishments are as strong and powerful as can be to observers! You can not only do hard things, but you can take those hard things by the horns and smash them into oblivion!!!!! Awww! That made me smile! You and me both, sister! We are in this until the bitter end. Together. You are so brave!! You have such a great attitude about your race and just life. It takes guts to be brave and forge ahead - you def have that!! Thank you, my friend! Sending brave vibes your way to carry you across that start line to the finish of Boston! You have an awesome attitude and I agree that it is about how we see ourselves. I am not content i being idle I need to push myself and foresee that when I head into my 40's in a few years I wont be slowing down but pushing forward and being brave. It's always worth it. You should be so proud of yourself! I'm older than you and I'm nowhere near ready to slow down yet! I think in some ways I am brave and in others I am not. I also think that bravery is a lot like a muscle - you have to exercise it or it will atrophy. It's important to keep pushing yourself and take on new challenges, both physical and otherwise. Keep finding days to step out of your comfort zone and get new experiences. I completely agree with you that bravery is like a muscle! It's hard sometimes to exercise it but its always worth it! 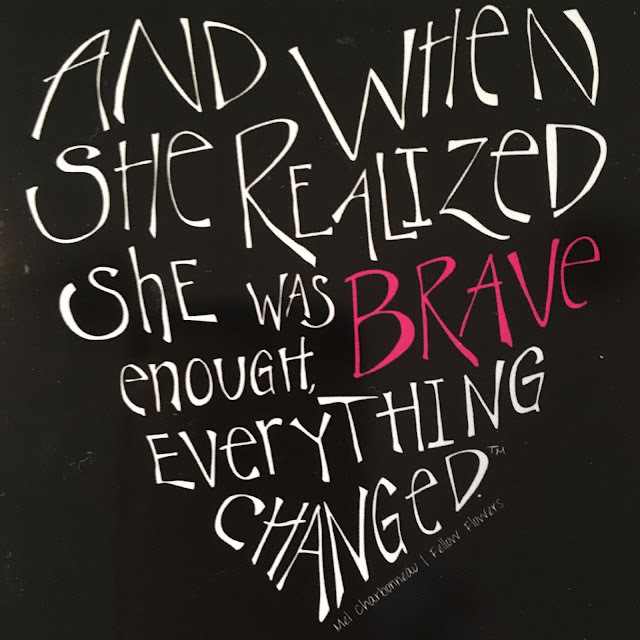 Lately my challenge has been with not being brave enough to push through and get myself out of my rut. I am working on getting back to where I was last year at this time, but it will take a ton of work and sometimes I feel like it is such an uphill battle and I am not brave enough to tackle it all and I make an excuse and then eat a Pint of Ben and Jerry's. It's so hard to pull myself out of a rut! I think that takes more bravery than anything else. But Ben and Jerry's? That trumps everything.